Van Slyke’s work is timely and readable despite a soul-chilling plot about pedophilia. 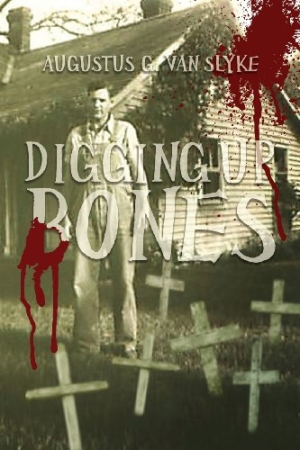 Augustus G. Van Slyke’s crime drama, Digging Up Bones, approaches a tough subject with the passion of an author who has seen justice too long delayed. It’s a readable book, despite the ugly crimes it depicts. The book is set in Pine Nut, Wisconsin, Christmas 1949, and tells a story as bleak as the chilly landscape. Sheriff Gordon Maxwell is hospitalized with a broken jaw. He’s an alcoholic who has lost another bottle battle. Maxwell also feels guilty for his inability to rescue young William Priestly, adopted son of a local farm couple. After the latest beating inflicted by his father, Will is comatose in a nearby room. But angels are at work, and soon the unlikely pair—the emotionally damaged sheriff and the abused boy—uncover and destroy a network of sexual deviants and child abusers. The plot is straightforward and soul chilling. Maxwell was traumatized in his youth while attending a local seminary, and he shows symptoms of post-traumatic stress disorder, having buried memories of other students being killed and interred in graves. After Will’s beating, two local children are kidnapped, and Maxwell and Will, with the help of supernatural appearances by the Archangel Raphael, investigate the crimes. Van Slyke uses the supernatural to move the plot, a device seldom employed in crime drama but here compatible with the theme of moral justice. Some might consider the plot to be hyperbolic. Yes, child sexual abuse occurs—and certainly some clergy within the Roman Catholic Church have sinned against children—but Van Slyke’s conspiracy seems overwrought. In a chronological story with flashback scenes marred by clumsy transitions, the third-person narrative is neither literary nor introspective. The book also sometimes resorts to clichés and humor that jar in a story about ugly crimes. Among the antagonists are perverted priests, local citizens, a Lutheran pastor, and a prominent physician. All are immersed in a world of pedophilia. The author points the finger at organized religion. More specifically, he targets the Roman Catholic Church, especially the “Legionnaires of the Christo,” no doubt based on the real Legion of Christ, the order founded by the now-disgraced Marcial Maciel, who’s referenced in the text. Two nurses, Anne and Pam, are presented as fully developed. Anne is hardworking, blunt, caring, and sometimes unladylike. Pam is the reluctant sexual plaything of one of the antagonists, wanting to be free. One antagonist, Father Svendly Pervasions, is a caricature whose dialogue is a mash-up of Brooklynese and German-English. Written as a Norway native who fought in the Wehrmacht and escaped with false papers obtained through Pius XII’s Vatican, he’s the most unbelievable. In this milieu, Maxwell is the only evolving persona; he comes to grips with his alcoholism and past traumas and, in doing so, becomes the story’s most likable character. Van Slyke’s work is readable and timely. It’s a difficult subject, but crime fiction buffs might enjoy the tale, and those touched by abuse might be pleased to see such perverted criminals brought to justice.